If you've done some research about nutrients that can help control blood sugar and improve insulin function, you know that there are quite a few options to sort through. Vitamins like vitamin A, minerals like chromium, herbs like gymnema, bitter melon and cinnamon can all help. Should you use this one, that one? All of them? Customers looking for blood sugar and insulin support have long sought a single product that has all the 'big guns' for blood sugar support, but doesn't overlap too many nutrients with their multivitamin. Nature's Way really hits this target well with their Blood Sugar w/ Gymnema Extract supplement. It's mostly an herbal supplement, with a substantial potency of the mineral chromium, in a highly bioavailable form (GTF chromium aka chromium polynicotinate). Suggested dose is 3 capsules twice a day, taken with food. If you have any kind of blood sugar or insulin disorder, time's unfortunately not on your side. Skip the trial-and-error and start using this comprehensive blood sugar support formula today. 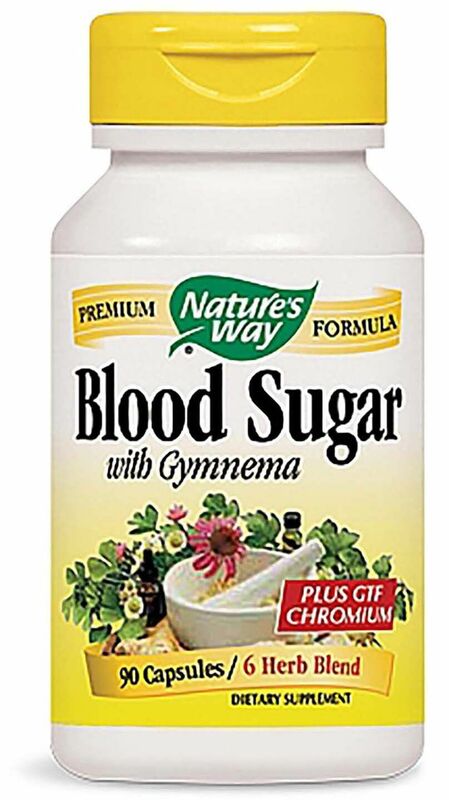 For best results, take Nature's Way Blood Sugar along with a multivitamin and an omega-3 supplement.